Little babies and children’s skin is more sensitive and thin than adult skin and the chemicals that are typically used on clothing can actually harm childrens’ skin. To produce one kilogram of cotton, an equal amount of chemicals may be used. We want the clothing to be as natural as possible and skin-friendly with the smaller wearer of our clothing in mind. Melli EcoDesign clothing made from organic cotton are safe for the sensitive skin of babies and children and does not cause allergic reactions. Organic cotton is soft, warm, and durable. It withstands prolonged use and washing. Our organic cotton is super worsted, which means that it has long fibers and does not pill easily. The colors used for the patterns are eco-friendly and are below Ökö-Tex 100 -standards, which means that they are safe. The cotton used in our clothing is GOTS-certified 100 % organic cotton. GOTS is an acronym for Global Organic Textile Standard ( www.global-standard.org ). The GOTS-standard is a broad ecological and ethical textile certificate that covers the entire production process from planting of the raw materials to the end of the production process. Taken into consideration are the health, safety, and well being of the people and animals involved. Child labor is prohibited. 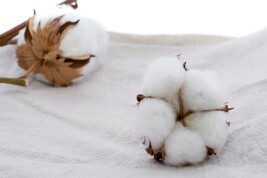 The cotton used in our clothing is produced in Greece where only organic fertilizers are used in farming. Herbicides and pesticides are not used. Organic farming leaves the land fertile and chemicals do not stress the ecosystem. The cotton harvest is gathered by hand so that the highest-quality materials are obtained. Only the ripe cotton balls are picked. Harvesting, when done by hand, does not produce the pollution that machine harvesting does. In addition, harvesting by hand ensures that the cotton balls are free of dirt, which makes the cleaning process easier.